Here are my lessons learned for this week! + Health is not to be taken for granted! I am getting better though thanks to my grandpa (who is an ER doctor) who called in a prescription for me! Say no to sinus infections. + I love shopping, still. I am an addict? + Family is awesome... I'm sitting next to my mom right now on the hotel bed! + I miss dance. I received my certificate for completing the World Dance minor at BYU and watched the BYU Folk Dance team dance on Wednesday... and I miss dance! 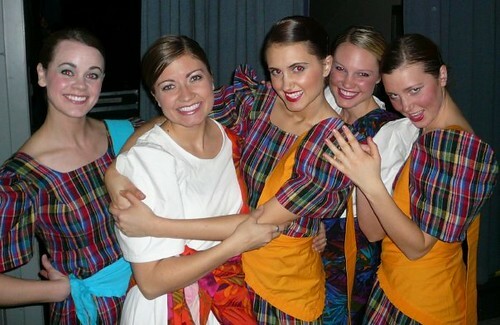 Dance was a lot of fun at BYU! See picture above. + Learned some good news...Kelsi got her Visa (she is in San Antonio, Texas on her mission temporarily) and is going to Sao, Paulo Brazil on Monday!!! + Even when you try to acquire extra raffle tickets to events to possibly win something, you probably still won't win. Haha. I went to the BYU Business Plan Competition for my Entrepreneurship Lecture Series class and for fun and didn't win anything ha. I won a free Business Plan Competition t-shirt in my Entrepreneurial Marketing class earlier in the week and they said if I wear it I will get an extra raffle ticket at the event so I did. I also liked the event on Facebook to get another ticket. No new iPad or Tv for me haha. Always worth the try. I also went to the Omniture Web Analytics Competition and many more in the past to try to win lol. + I still love Antoine Dodson. Enough said. + I like the BYU's Humor U "Jimmer" Antoine Dodson You Tube video. + I like the BYU's Humor U Old Spice You Tube video. Until next week! Tschus! Guten nacht!